Why in the world would ‘Carmen’ fly to Central America on Malaysia Airlines? Here’s another addition to the “don’t just use the first image you find” file. During “Deadline: White House” on MSNBC, the network was covering a federal judge’s order to have a plane carrying a woman only identified as “Carmen” and her child returned to the United States after being deported to Central America. “Carmen” is a plaintiff a the lawsuit the judge was hearing over asylum restrictions. 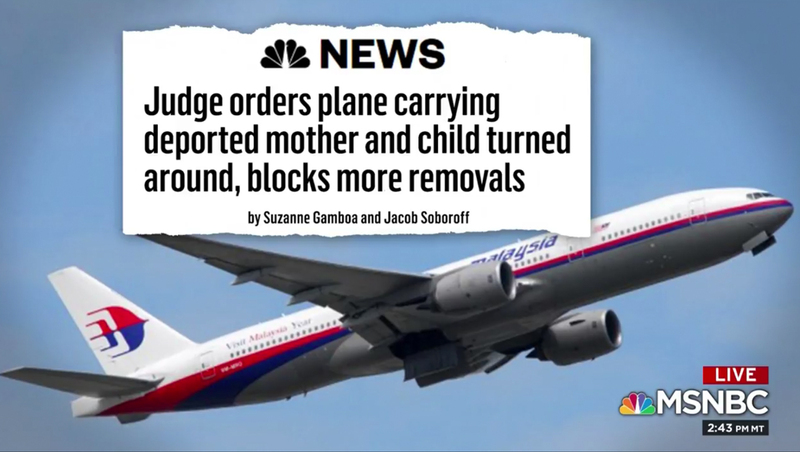 The show put up a fullscreen image of the headline “Judge orders plane carrying deported mother and child turned around, blocks more removals,” a pivotal piece of reporting from Suzanne Gamboa and Jacob Soboroff. The “torn from the headlines” style element was placed over an image of a plane which, upon closer inspection, has Malaysia Airlines livery. The problem is, as you might surmise given its name, Malaysia Airlines doesn’t appear to fly to Central America, according to a list of destinations posted on its website. Checking several major airports to destinations the airlines does serve seems to indicate it’s hard (if not impossible) to get a flight out of the U.S. on it at all. The airline appears to operate mostly in the United Kingdom, Asia and the South Pacific region. Malaysia Airlines was much in the news in 2014 after a flight from Kuala Lumpur International Airport to Beijing, China disappeared in March. The incident remains unsolved and the complete wreckage of the plane has never been found. Later, in July of 2014, a Malaysia Airlines flight from Kuala Lumpur International Airport from Amsterdam was shot down over Ukraine, killing everyone on board. It’s worth noting “Deadline” never claimed the photo was of the actual plane “Carmen” flew, but rather was using the photo as a “stock image.” That said, finding a nonbranded airplane photo wouldn’t have been that hard. NewscastStudio reached out to MSNBC for comment on why the image was used.